Caves of Bombay! Yes! I am referring to more than two hundred heritage caves with sculptures rivalling that of the famous Ellora, within 20 km of the city centre of Bombay! Does commerce alone makes a global city? This is the question the Archaeological survey of India or the Tourism Department of Maharashtra and the city planners of Bombay have to decide, for around Bombay are six groups of caves — Mandapeshwar, Kanheri, Jogeshwari, Karla, Mahakali. and Elephanta — with exquisite rock sculptures. And the sad fact is that with the exception of Elephanta, which has been declared as a World heritage site by Unesco, the other five caves are fast disintegrating due to lack of maintenance. The area around Bombay was a part of the Magadha empire ruled by the Buddhist emperor Ashoka in the 3rd century BC. The sculptures of the Kanheri caves, Jogeshwari caves and the Mahakali caves date back to this era. The Hindu cave temples of Siva, on the island of Elephanta, in the Bombay harbour, contain some of the most magnificent examples of stone carving in India. The dating of all these caves seems to be controversial. They were probably finished some time between 450 and 750 AD. Believe it or not, the local mafias — in collusion with politicians and bureaucrats — have moved into these precious sites, threatening and intimidating those who have tried to raise a voice in protest or to protect them. The staff of the Archaeological Survey of India (ASI), which is in charge of these national treasures, have revealed a genuine fear and inability to monitor these sites due to lack of policing power/ and the capability of the ASI to protect their lives if they try to control the encroachers. Let us examine the present condition of some of these caves. Today the Karla caves are a picnickers’ haven, with any individual able to enter the shrines without paying entrance fee or accompanied by caretakers who will ensure that the artistic treasures are not damaged. Incidentally the Chaitya (stupa) inside caves is the largest in India. Further the ASI states that the chhatri atop the Chaitya caves is of wood. That means this wooden chhatri has been in existence for more than 2000 years! In any historically conscious nation, even if it is only 200 years old, there would have been an attempt for its preservation. Here in Bombay collegians spend their time in hurling coins and other hard stones at the chhatri to see, if their aim is strong enough! In Mahakali caves you can hardly walk in, due to discarded condoms used by couples seeking private moments, charred remains of drug users’ fires, plastic and cellophane garbage of visitors and last but not least the amorous graffiti engraved on the walls by heartless Indian tourists. In the Jogeshwari caves a group of "developers’ posing as Jogeshwari Mata Mandir Trust are the de facto owners of these 6th century AD caves and have altered the interior for placing the idols of deities for commercial exploitation. Experts point out that the quality of craftsmanship at Jogeshwari is so similar to Elephanta, that it is believed the same group of artisans probably worked on both caves. Unfortunately it is the site most encroached upon. Not only has a colony been built on top of it, but the sewage water that constantly drains into the cave from the colony is rapidly eroding the rock. 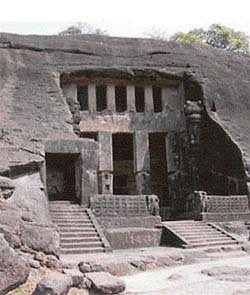 Mandapeshwar cave sculptures are a difficult site for political reasons as two religious groups claim ownership of the site. But the authorities should not make it a reason for neglect. There are 101 numbered caves in the Kanheri complex – a working Buddhist monastery – ranging from full temples to simple living quarters. The earliest caves may have been excavated in the first century AD and the latest date from the 11th century. The ASI had allotted Rs 25 lakh for the development of the Kanheri caves, but precious little has been done due to the powerful lobby of real estate agents and encroachers. At Elephanta, for example, where the Indian National Trust for Art and Cultural Heritage (INTACH) has been working to improve local conditions and the cave site, local vested interests who had violated all encroachment laws had made every effort to thwart, threaten, and malign the efforts. It was only the intervention of Unesco that managed to save the site from gross abuse.